This service automatically, starts immediately after ordering. Telegram Followers for chanels / chats. Telegram is a new project of Pavel Durov, which was initially positioned as the world's safest messenger. However, due to the wide range of options and opportunities, it has become a promising platform for the promotion of new products/services, brands, know-how and interesting ideas of users. At the same time, many customers tend to buy a load-up of telegram followers for several reasons: promote your channel to increase the cost of advertising placed on it; present a new product, brand to a wide range of potential customers. 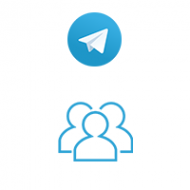 The advantage of Telegram channels, namely the easy way of communication and the simple content distribution, is a good way for many users and businesses to stay in touch with their contacts or increase the audience via Telegram channels. If a user wants a large number of members without any slowdown, the cheapest way for him would be to load up followers. The advantage of such followers is that they usually do not leave, unless the Telegram platform begins to consider them non-active and delete them. This interest in the load-up of the new messenger is due to the faster response of its users to the posts. In addition, when assessing the cost of advertising sites in this network, only a few factors are taken into account: number of followers and views of the post.